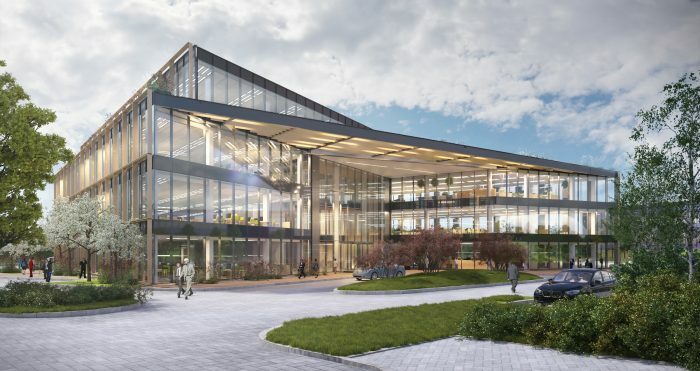 The Park has set out its new office building designs having submitted a full planning application to speculatively build a 61,500 sq ft (5,713 sq m) state of the art office, with a roof terrace, capable of accommodating 500 employees. The proposal is for Plot 12, which is a 1.2 hectare (2.96 acre) site that sits prominently in the middle of the Park’s masterplan. The Park has 13 acres of development land, and Plot 12 is the first building to be submitted for planning since it was announced in January 2016 that Magdalen College has taken 100% ownership and has development plans for an additional 300,000+ sq ft of office and laboratory space to be built in the next five to seven years. The Plot 12 building will be four storeys, with excellent views. It will be contemporary, reflecting emerging trends for ‘smart working’ and employee wellbeing. It will be available to let on either a single tenancy as a global headquarters, or multi-let with flexibility to accommodate two tenancies per floor. It would be built to the highest environmental requirements and be rated at least BREEAM Very Good. There will be 80 cycle parking spaces with a dedicated bike store and change facilities, and car parking for 203 cars. Landscaping is integral to the Park’s attraction and it is proposed that Plot 12 will be a positive addition to the surrounding parkland, reinforcing the existing landscape strategy to create a sense of place and well-being where people can relax and collaborate. Piers Scrimshaw-Wright, managing director, The Oxford Science Park said: “The Oxford Science Park was established 25 years ago as a business community to support discovery, innovation and entrepreneurship. Today, companies are thriving here thanks to our world renowned location, their constant pursuit for innovation, and their talented people, all supported by the Park’s exclusive environment and contemporary workplace offering.